Don’t have a garden party or brunch planned? That’s okay, it can also be eaten as a fresh creamy afternoon snack, healthy with protein, rich with cleansing and energizing vitamin C, and did you know lavender oil eliminates nervous tension, relieves pain, disinfects skin, and enhances blood circulation? So this tart is a powerhouse of nutrition as well as being as pretty as a teacup! You could even present it to your mother as a homemade gift – because pie! And the star of this recipe, is my amazing tart shell recipe – it actually has the texture of a traditional pie crust – kind of flaky, kind of crumbly – but no baking or dairy involved. And fool-proof, so they are easy to remove from tart pans, and SO keep shape when filled. This, my friends, is the ultimate raw tart shell. And this awesome texture was largely made possible because of the super fine grind I was able to achieve using my new powerful blender. Not only does it pulverize faster than any machine I have experienced (and I have gone through 3 blenders and 2 food processors), this blender also comes with a dishwasher-safe container. You heard me right, DISH-WASHER SAFE! Another fun aspect is that Vitamix is coming out with 20 oz and 8 oz size cups that fit the machine! And I could go on stating attributes, but you can find all the blender deets on the Vitamix site.So for now, let’s see how it performed in my recipe, shall we? 3-5 drops lavender extract ( I use extract which contains alcohol; if you’d prefer, you can use culinary lavender oil, though it is much more expensive. Blend ingredients for the shells, adding the coconut oil last. I left these rather sweet-free, more pie-crust-like, but if you want to sweeten, add some coconut sugar to taste. Regarding easy of removal from pans, the fine grind I was able to achieve with my A3500 Vitamix made these shells very easy to remove, but an additional trick I’ll share with you is to grease each tart pan with coconut oil, and dust with coconut or almond flour. Then press the mixture into tart pans, and freeze for 30 minutes. Make sure they are firm to touch. After 30 minutes, remove tarts from pans, ready to fill. Very important step, removing the tarts from pans before you fill. I forgot that step in a first try, and it wasn’t pretty. 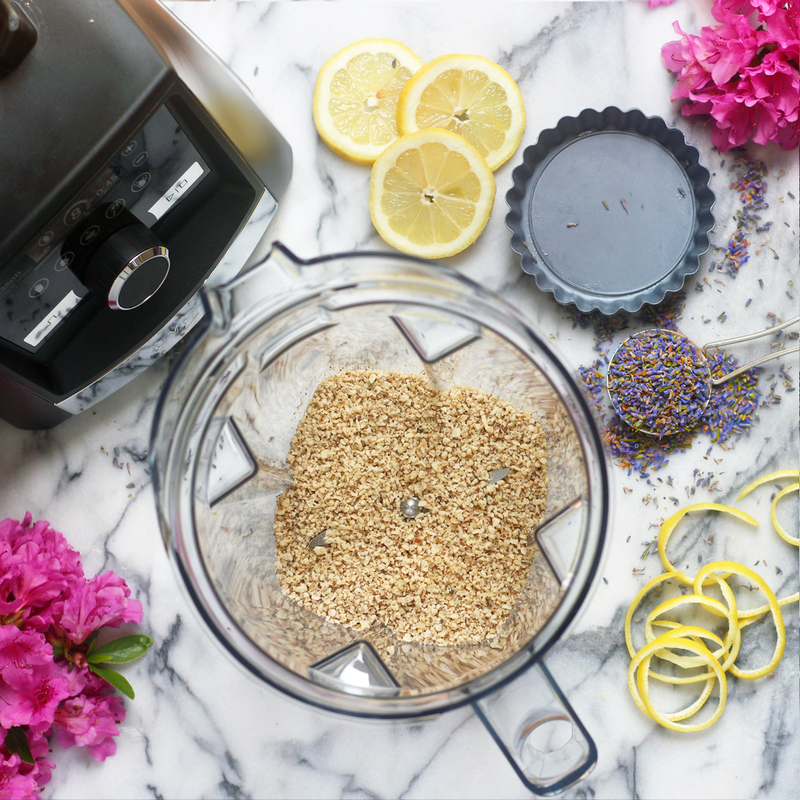 Blend all ingredients for the lemon lavender cream. Add in the turmeric last. Just a pinch to make the mixture a lemony yellow. Blend until of uniform color. Pour mixture into tart pans. Refrigerate tarts for at least 30 minutes before eating. 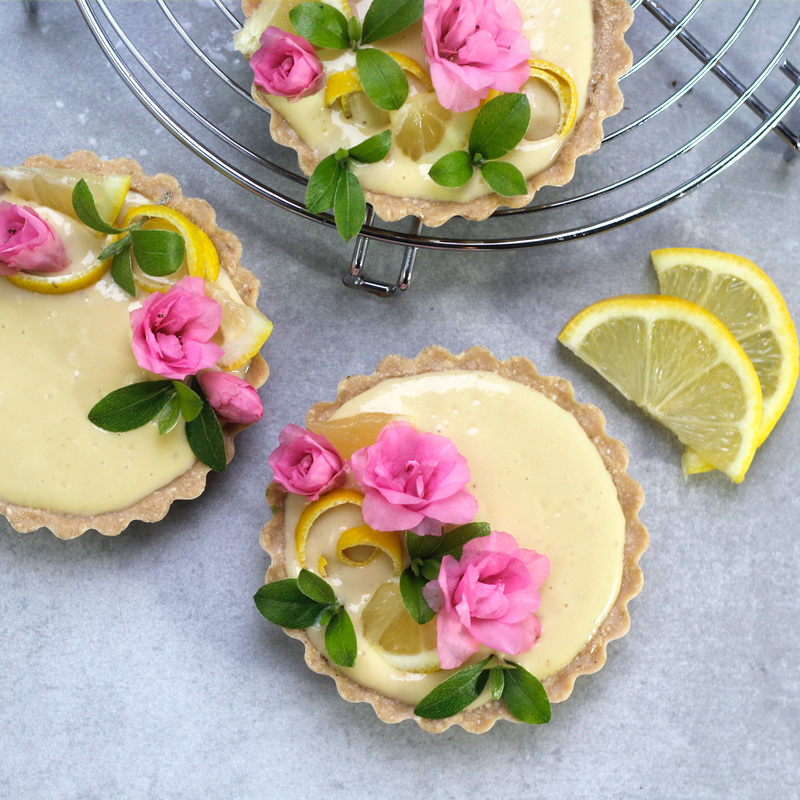 Garnish with lemon triangles, lemon rind curls, a sprinkle of lavender buds and enjoy!